The finished moulage can be used as-is for certain types of garments, including those for knits. But typically you use it as the starting point for making patterns of other types of garments. More on this later. The textbook we are using for the class is The Moulage, a self-published book on CD by Kenneth D. King. Maynard is a colleague and collaborator of King’s; she knows the system exceedingly well. Maynard departs from King’s instructions in minor ways, but overall the textbook is very detailed and straightforward. In class, I was often able to answer questions from the textbook before I had a chance to interact with the instructor one-on-one. The first class was devoted towards taking measurements. The instructor demonstrated each measurement necessary to draft the moulage. We split up into groups and measured each other. My measuring partner was unsure of the accuracy of his measurements; fortunately this was not a problem as the instructor was willing to check measurements for anyone who asked. The outcome of this process was a sheet with our individual measurements, that we would use to draft our own personal moulage. We also filled out a separate worksheet, calculating some numbers from the measurements we would use as the basis of the draft. The instructor led us through those calculations. Some students used fraction calculator apps for modern smartphones, that make the arithmetic easier to digest. Weeks two and three of the class were devoted towards drafting the back and front pieces of the moulage, respectively. The instructor would give us a few steps to follow, we would go to our worktables and draft, then come back for more. The back piece is the same for both men and women, but for men the draft for the front is both different and simpler. We covered both variations in class. I drafted the men’s version for myself, but took careful notes of the women’s draft for potential future projects. You can see here in the photo the men’s front draft has some cutting and slashing work to pivot out a dart introduced on the armscye; the women’s draft has more darts and is more involved. The women’s draft basically pivots several darts into a princess seam. 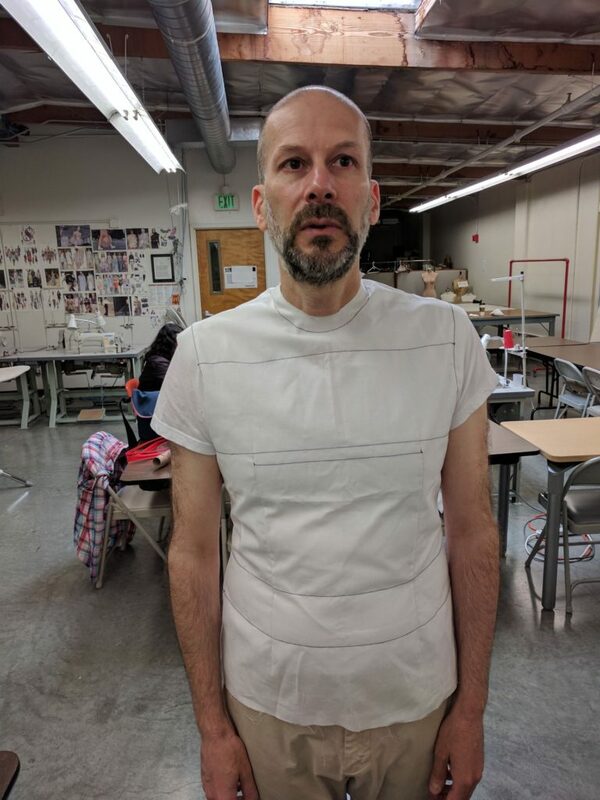 After our draft was complete, our homework assignment was to sew a muslin from our moulage draft, for fitting in class the next session. I traced out the muslin from the raw draft and added 1-inch seam allowances everywhere. The extra-wide seam allowances are for fitting purposes. My front pattern trace has an error at ceter front; the front piece is cut on fold so there is no seam allowance. The back piece is cut as two. (I caught the mistake before cutting fabric – it’s a common error to make). The muslin has horizontal balance lines sewn as thread traces for fitting. The balance lines are crucial; the instructor would not fit muslins which did not have them. I also traced the stitching lines with a tracing wheel and sewed directly on the stitching lines, for accuracy. We run a zipper all the way up the back to get in and out of the muslin. It is crucial the center back line on both meets precisely at center back. To get this to work, I sewed the center back seam line with a basting stitch and pressed the seam allowances open. Then I overlaid the zipper with the teeth centered on the seam line, stitched the zipper in place with a zipper foot, then undid the basting with a seam ripper. 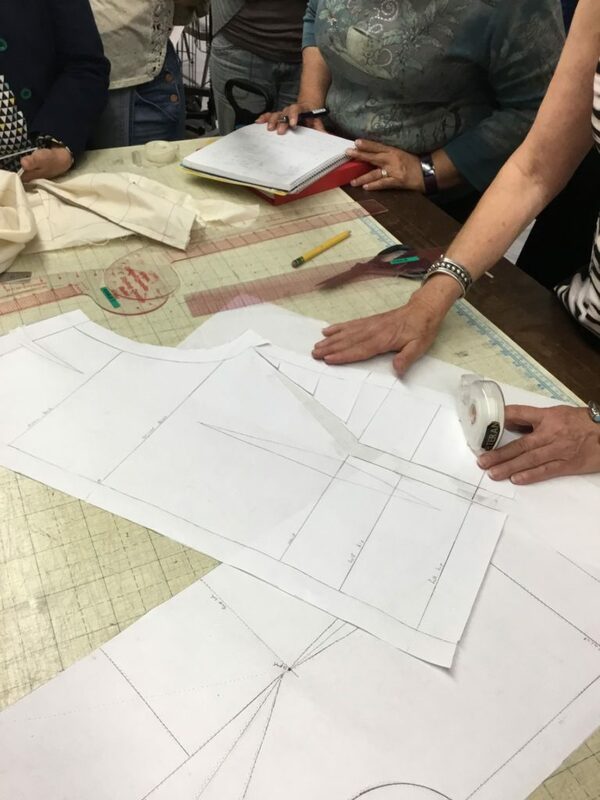 Our most recent class was a giant fitting and pattern alteration session. Each of us took turns posing in front of the class wearing our muslin. The instructor used the opportunity to teach us about the fit issues in each of the muslins, as well as the method to correct them. To a fit nerd like me, this two-hour fitting session was like being in Disneyland. The instructor invited us to assess the fit before her assessment, and solicited volunteers to make the alterations. One common alteration is adjusting the shoulder line. The shoulder line is very crucial for proper fit; once the shoulder is adjusted properly many problems lower in the garment often disappear. 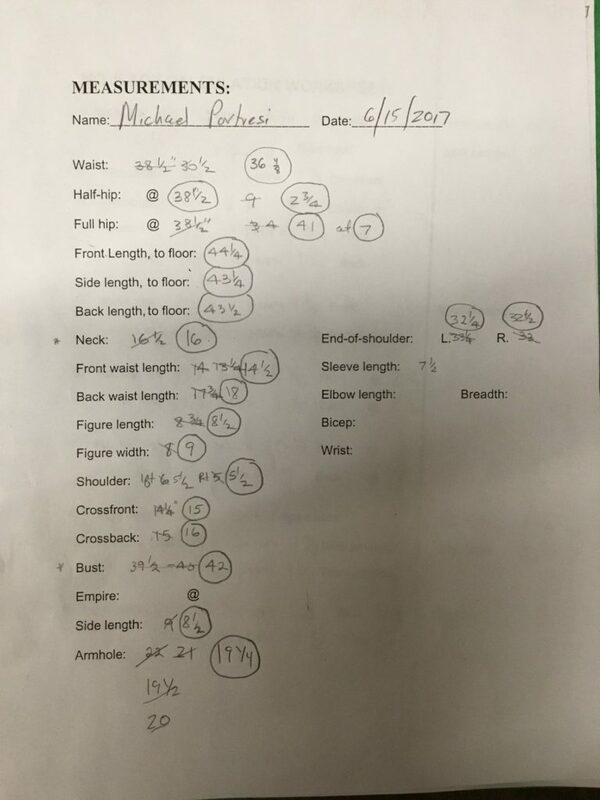 I would have had an easier time with my recent fitting experience if I had addressed the shoulders early on. Another common adjustment was to add extra room to accommodate the seat. The indicator for this issue was fabric bunching horizontally across the small of the back. 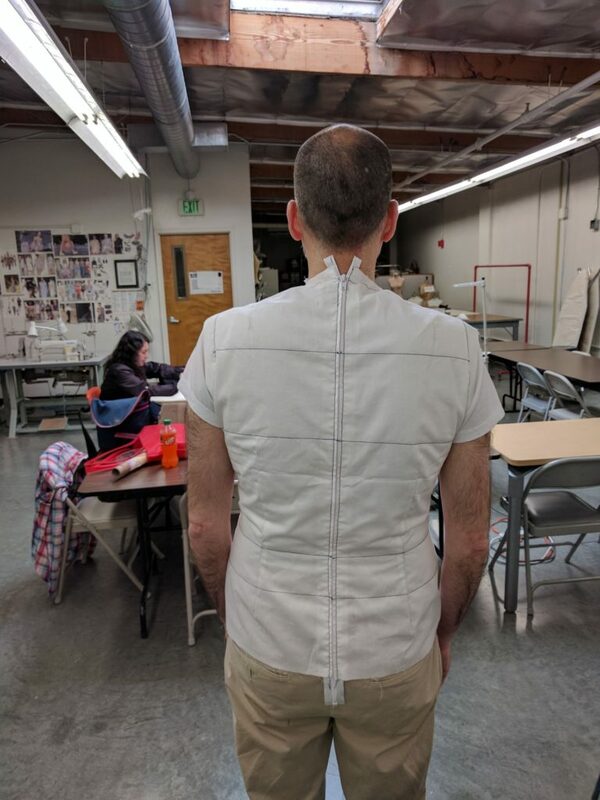 A few people in the class – mostly the guys – needed no fitting adjustments to their muslin. I was one of them. 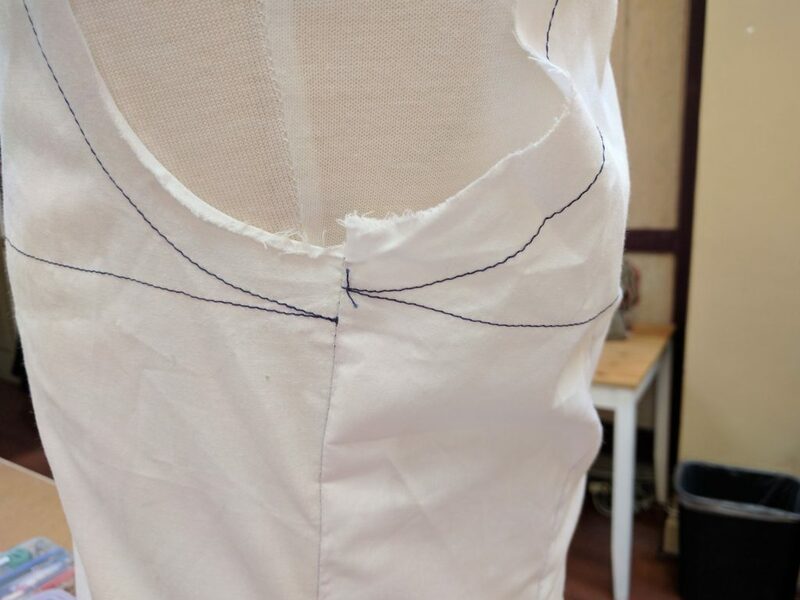 I still have to revise my moulage pattern though, due to a mistake I made in drafting; I lowered the underarm point on the front piece, and the side seam in front ended up too short compared to the side seam in back. The front is on the left in this photo. Fortunately, with the 1-inch seam allowances this did not get in the way of fitting. After the fitting session, the instructor showed us how to make the flat-pattern adjustments for each kind of fitting change. We saw full bust adjustments, booty (seat) adjustments, and full belly adjustments. The students then updated their moulage patterns accordingly. 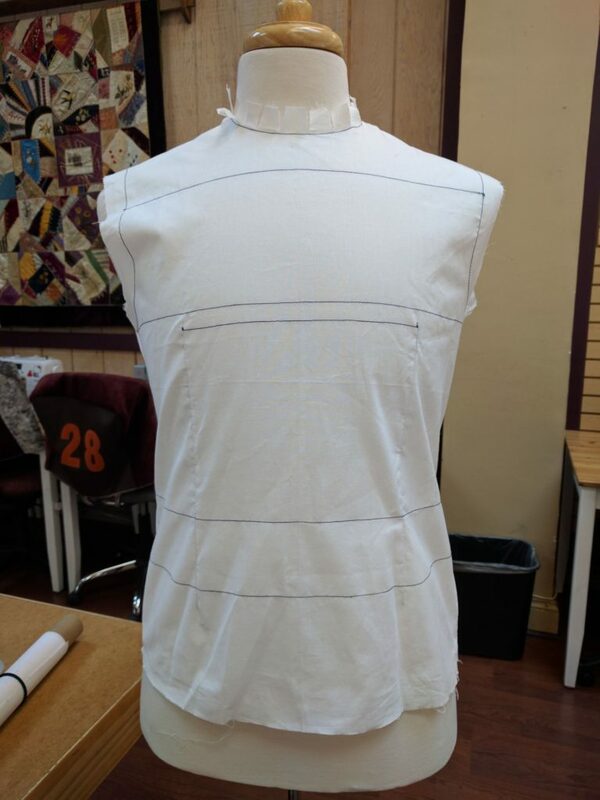 The primary goal for the class is for each student to create a clean pattern draft for a moulage that fits them, as well as a fitting muslin garment. But the class has stretch goals. 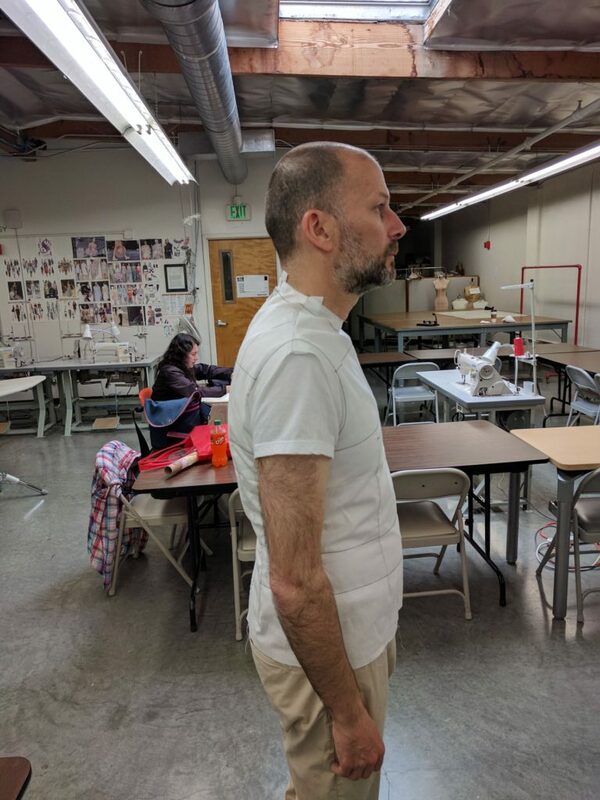 The moulage by itself can be used to draft a form-fitting garment, or to make a garment from knit fabrics, which have stretch and are often skin-tight. But to be useful for other types of patterns, a sloper is created. The sloper adds wearing ease to the moulage and produces a wearable garment, albeit devoid of style. There are multiple sloper patterns one can create from the moulage. The first is for a blouse, dress or shirt. The second is a jacket sloper; it adds more ease to the shirt/blouse sloper. And the third is an overcoat sloper, which adds more ease to the jacket sloper. The textbook contains instructions for all three types of sloper. 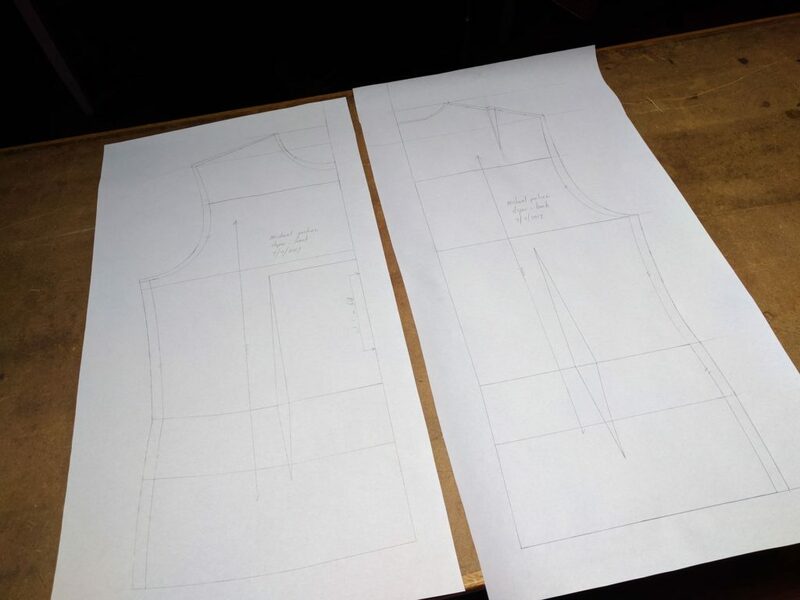 In class, we are drafting the shirt/blouse sloper, as well as a matching sleeve for it. It is not possible to fit a sleeve to the moulage draft, as it is too tight and creates mobility issues with a sleeve attached. I traced off my completed Moulage pattern and followed the instructions to produce a sloper pattern. You can see both here in this photo, with the sloper having a lowered neckline, higher shoulder, and expanded side seams. I’m currently sewing up the muslin for the sloper now and hope to fit it in the upcoming class, as well as produce a sleeve for it. Once class is complete, I plan to adapt the shirt/blouse sloper into a dress-shirt pattern. I’m curious to see how it fits compared to the pattern I fitted to myself starting from a trace of a commercial design. With Michael’s permission I am going to share my thoughts on the concept of the moulage. 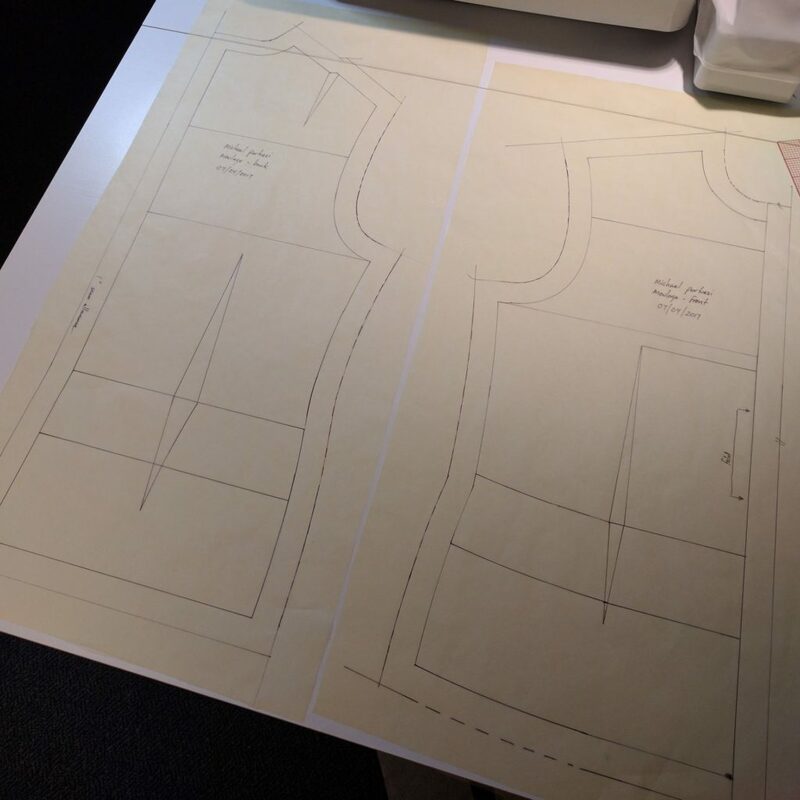 Many if not most pattern making approaches are based on the needs of the fashion industry and the standardized shapes they use as seen in commercial dress forms. The moulage as described by Kenneth King, who teaches at FIT, relies on a double ended dart in the front and back. The double ended dart is appropriate when the the body as seen from the side has the same projection for the bust and the tummy in front and the same projection for the shoulder blades and the hips in back. I have put an image on my website that compares the contours of an industry standard dress form to a real person. The double ended dart would work for the dress form but not for this individual. When the projections for a specific body of the front and/or back are not the same, fitting adjustments need to be made. 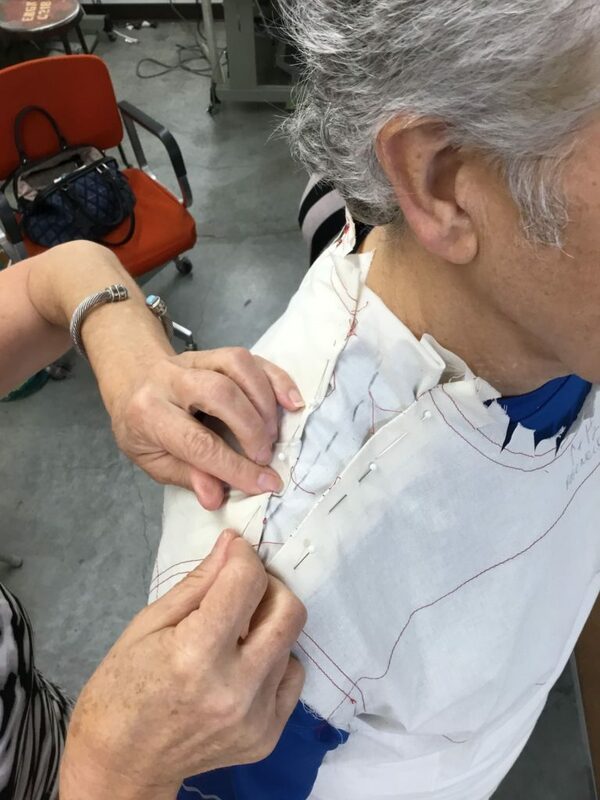 When the fitting is done in fabric, the give in the fabric allows it to be shaped to the contours of the body. But when this fitting is then transferred back to a paper pattern to make a sloper, the “give” can result in a paper pattern that is not a true reflection of the contours of the body. This can then result in designs made from these patterns that have additional fitting issues. 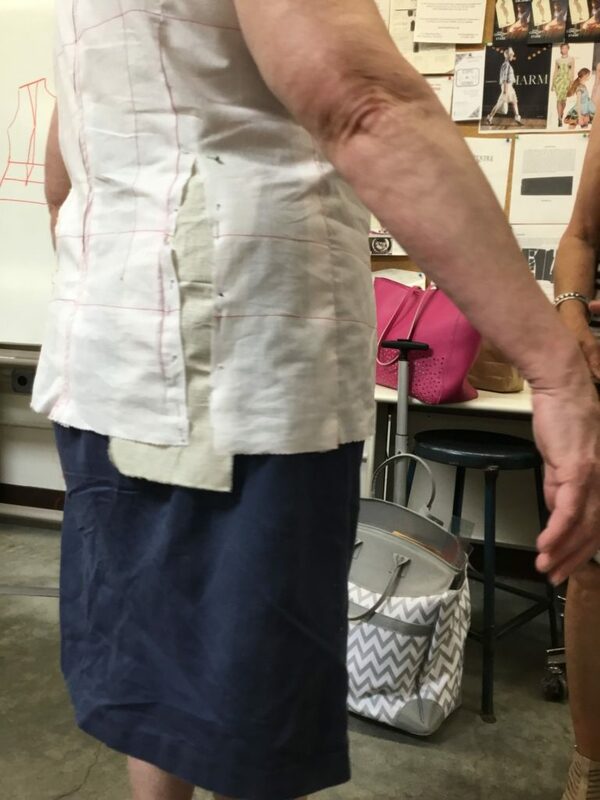 My conclusion from teaching pattern design since the 70s is that most bodies are best served by creating a fitted sloper that has a waist seam. 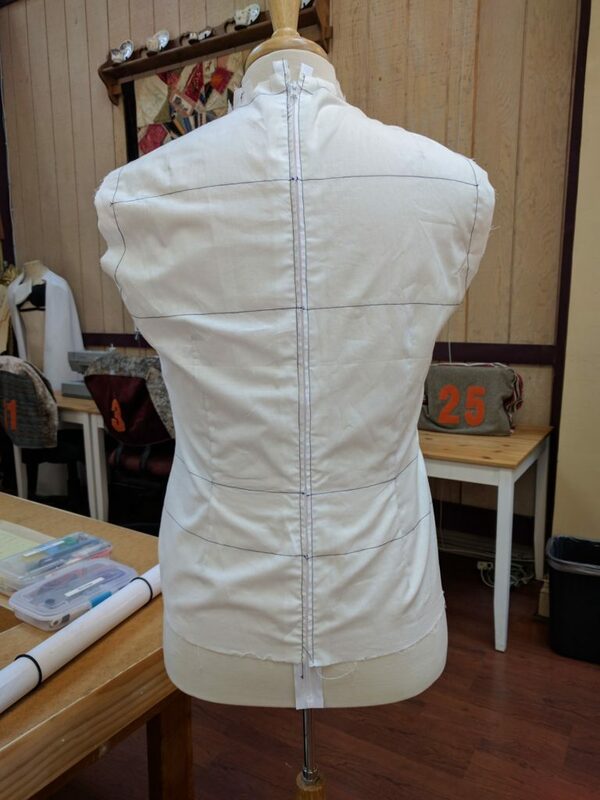 This allows front and back patterns to be created for an accurate representation of the upper body and front and back patterns for the lower body regardless of the contours of the person. My mantra has become that you can only rely on any measurement system for the size of the body, NOT the shape. Both the size and shape are important for any patterns that are to have an accurate custom-fit. The Moulage was developed in the mid-1800s at the school Ecole Guerre-Lavigne in Paris. It is based off genuine human body proportions, having been developed as a consequence of the invention of the numbered tape measure. It takes advantage of the common body proportions we all share, even if our actual dimensions are different. In his Moulage textbook, Kenneth D. King provides a section on the history and origins of the system. To be honest I wish someone would do a comparative study of the different pattern making systems that have evolved over the centuries. I think it could make for a very interesting masters thesis. I love these classic instructions for making Jodhpurs–which I have never tried. The Lutterloh System, which has been around since the 1930s, is based on a mathematical formula used by Leonardo da Vinci. The Lutterloh System on their website says: “you need only two measurements to make a perfectly fitting pattern every time.” Leonardo was clearly a genius–he couldn’t possibly be wrong. I had a model/design student one time that was interested in this theory so we tested it. Measurements of her body did not fit the formula. 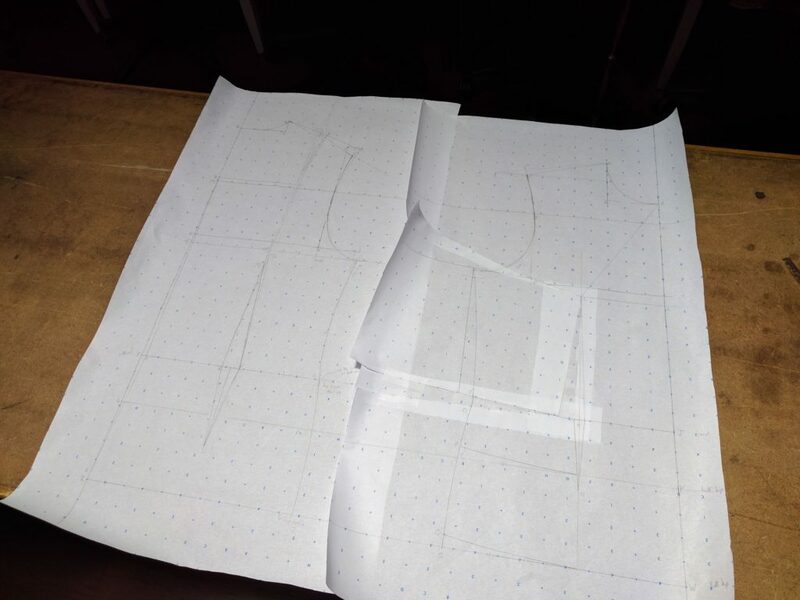 I developed my pattern design system as a costumer where you need to be able to create garments for any body shape, from any period of history, for any design (even fantasy and science fiction). Working with individuals over the years I marvel at the unsurpassed genius of Mother Nature who never repeats the same shape of anything–think snow flakes. In my experience she uses this same awesome approach to the human body. This was brought home to me with a vengeance when I was teaching pattern design at San Francisco City College through adult ed back in the 70s. I had a student who had a twin sister and they shared a common wardrobe. Any garment one of them could wear, the other could wear as well. My student made a simple medieval style wedding dress custom-fit on her sister. She wanted to know what she would like in a wedding dress but she couldn’t get into it. So what I have learned from Mother Nature surpasses any human created system for evaluating body shapes from measurements, even Leonardo da Vinci. This is why I say measurements will indicate a general size but never reveal the specific contours of an individual human body.